At the top of the page you will see the MMS Sales Order section. This is the section that displays your sales order information. Under the MMS Sales Order section you will see the Sales Order Number that is being created by customer orders and your cost. If you click on the sales order number (SO-#######) you will be taken to your dealer account page on Murphy’s Magic. You will also see a list of your customer orders that will be included in the sales order. (1) The Murphy’s Sales Order number that will be sent to Murphy’s for fulfillment. (2) The order amount that will be charged to your Murphy’s account (your cost). (3) A list of customer orders that are included in the Murphy’s order. Auto Submit OR Submit Sales Order Manually. Submitting the sales order manually is recommended when you are first starting out so that you can bundle your customers’ orders for optimum efficiency. To have your orders automatically submitted to Murphy’s Magic every day enter the time you want the order submitted in the Auto Submit Sales Order field. You must enter the time in military time using whole numbers only. For instance, to set the time for 1:00 pm you would enter 13 in the field. If you wish to submit the sales order yourself on an as needed basis, you will want to keep track of which orders have been submitted. Click on the individual Customer Order, eg. 3060 and this will take you to that customer order’s details page as shown in the image on the right..
On the order details page use the Order status drop-down menu to change the order status to “Sales Order Submitted.” This is only a label change to let you know that the order has been submitted. This action does NOT submit the order to Murphy’s. Click on the Save Order button to save the order status change. Click on the MMS Integration link in the left navigation bar to return to the Murphy’s Sales Order Listing. Repeat this process for each customer order listed in the MMS Sales Order section. 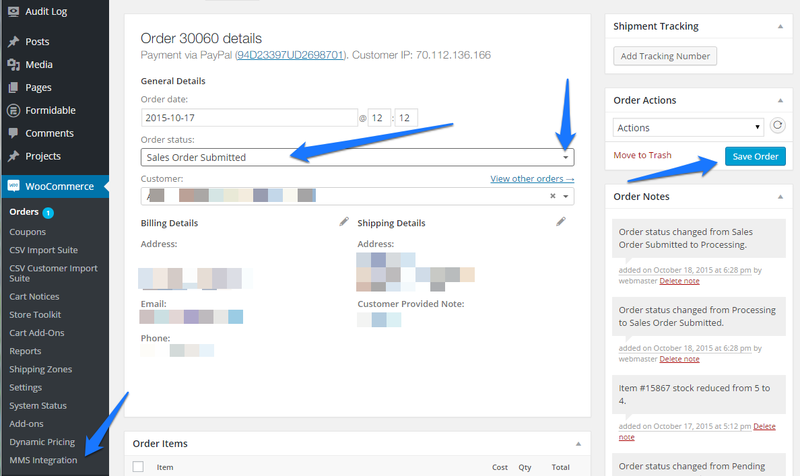 Once you have changed the order status of customer orders to “Sales Order Submitted” you can submit the sales order. Changing the order status for each order does not take long and helps ensure accuracy, particularly when there are several orders of the same product. Toggle the Submit Sales Order check box to submit your sales order and Save changes as shown in the Final Step. Whether you just set the Auto Submit time or clicked the Submit Sales Order field YOU MUST CLICK THE SAVE BUTTON AT THE BOTTOM OF THE PAGE TO SAVE YOUR CHANGES. Click the blue Save Changes button at the bottom of the page to save/submit.